Ask anybody who flies out of Oregon's Aurora State Airport (KUAO) on a regular basis, and they'll probably tell you one thing  they love it. 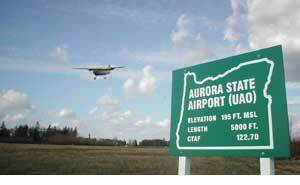 Aurora State is the third-busiest airport in Oregon, just behind Portland International and Portland-Hillsboro. After several decades as a non-towered field, an FAA control tower opened in 2015. The tower makes getting in the air a breeze — just provide the controllers with your info, and before long you'll be assigned a mile of runway for a smooth climb-out. For the seasoned pilot, Aurora is a great jumping-off point that's within easy reach of the Portland metropolitan area, the scenic Cascade Mountains, the popular Oregon Coast, and the vast Willamette Valley to the south. For students, that big runway means they have lots of room to practice those first awkward takeoff rolls  and just as much surface to negotiate a few unwieldy landings (not that they don't happen to all of us from time to time). Operated and inspected by the State of Oregon, Aurora State Airport is located one mile northwest of Aurora, Ore. Elevation is 200 ft. (61.0 meters), with estimated Lat./Long. of 45-14.83' N / 122-46.20' W. The facility is open to the public and can be found on the Seattle sectional chart. UAO's runway is oriented at 17/35, and the surface has dimensions of 5,004 x 100 ft (1,525 x 30 m). The calm-wind runway is 35 (changed from 17 in June 2008). Traffic Pattern Altitude for piston aircraft is 1,000' AGL (1,200' MSL). Punch up the Tower frequency when you're in the area  it's 120.35, which also is the Unicom when the tower is closed. Ground control is reached on 119.15. Automated weather observations can be heard on the ASOS at 118.525. And, of course, you'll have no problem with tie-downs and fuel  Willamette Aviation offers both near the north end of the field (Runway 17). We're just off the taxiway past the ExxonMobil fuel island. Pilots flying out of Aurora State (KUAO) should be aware that the facility adopted a noise-abatement policy in 2007 in order to minimize aircraft noise over residential areas. For some time now, student pilots have been instructed to avoid overflying the towns of Aurora and Barlow, as well as the Charbonneau community, but the new policy spells out more precise departure and arrival procedures for VFR traffic. In all instances, pilots are advised to avoid flying over congested areas, which include Aurora, Charbonneau, and Barlow. Pilots also should bear in mind that the calm-wind runway at UAO is 35, and that winds are considered "calm" when less than five (5) knots. Upon arrival, pilots should fly as instructed by the control tower. Mid-field crossings in piston aircraft should be made at 2,200 feet MSL. Upon departure, pilots should fly the runway heading to 900 ft. MSL and then make a 45-deg. turns to avoid populated areas to the north and south of the field. Operating a safe and efficient air transportation system is a challenge  it's courteous and responsible pilots who make the difference by avoiding unnecessary residential overflights and by flying as quietly as safety permits. We want to do our best to maintain a "good neighbor" relationship with our nearby communities, and we ask that all pilots do their part by cooperating with these procedures and guidelines.